August 28, 2013 February 10, 2016 ~ Sara W.
My friend posted a video on her Facebook page yesterday about Pinterest Perfection. In the video it speaks to the impossible task of living up to the Pinterest world. At one point, the woman confesses, “Real is in.” Well, if real is in, I’m about to give our readers a full dose of real. Do you remember my post two months ago entitled No Excuses, No Explanations? Well, I’m stocked full of them right now. You may or may not have noticed that I did not post last week. I noticed because it got added on to my list of reasons why I’m feeling like a pure flop right now. Are you ready? I was already feeling blue before last week even hit me. Three out of my four closest friends in my new hometown somehow managed to plan all of their end-of-summer vacations at the same time. How dare they, huh? Add on that my BFF (Best Friend Forever) was visiting from Southern California and she left to go home on Monday. Post-BFF blues kicked in. Add on that my husband had been working crazy long hours. Are you seeing how my social support was lacking? That’s a sure sign of impending doom for my emotional well-being. Then last Tuesday, I tweaked my back in the morning during a routine struggle to get my son in his high chair. I could tell right away it wasn’t good. I tried to work through the pain. I couldn’t take any of my known remedies, as there was a small chance that I was pregnant. As a result, I was left with Tylenol and ice as my only relief. Thankfully, I live in a very supportive community. I had a friend come and put my son down in his crib for his nap. That allowed for some rest on my end too. So as not to drag out the story, I will sum this portion up with the basics. Husband called off from work, a trip to the ER was had, tests confirmed I was not pregnant so I could receive appropriate medication, x-ray showed a straight spine in all the wrong places, and my legs were completely uneven. In short, pain killers and muscle relaxers were not going to give me enough relief to get back to better. Plus, we had to cancel a destination wedding we had planned to attend this past weekend since driving for hours on end would be physically impossible. Then, hormones hit. Oh, blasted hormones. How I despise you! As if pain hadn’t made me grouchy enough, hormones had to arrive on the scene. Sadly, my family were the real victims in this downward spiral. My eldest daughter took the brunt of it. Every single time I think I’m going to seriously lose my mind with my eldest, I am forced to look at myself in the mirror. Does anybody else out there sometimes turn in to this ugly person that affects the behavior of all those around them for the worst? Generally, I would like to think that I bring out the best in others. That was certainly not the case this past week. I would gladly have preferred being sent away from society so as not to emotionally damage those in contact with me. So, as things were looking particularly bleak, I began to add on more negative thoughts to really make the week eventful. I started to think of all the things I was NOT doing right. Our budget is a good example. Two pay periods of following the budget. Then BAM! Back to School needs hit. Now, I’m over budget, lacking in my usual social support, taking things out on those I love most, in pain, and fighting my primal desire to turn in to a werewolf the way Jacob does in The Twilight Series. I managed to hold it together enough by continually pondering this analogy I once read: If you get a flat tire, you fix it and get back on the road. You don’t go and poke holes in the remaining three tires. I really did try the best that I could to stop jamming a knife into my remaining three tires. My husband may say differently. He said one of my screaming fits with my eldest was almost comical. He referenced remarks made in Bill Cosby, Himself when Bill Cosby speaks about how his wife was once beautiful and then she had kids. It may sound hurtful, but truly it’s the most honest bit of comedy gold when he describes how children change us. I really was trying, then nature poked a hole in one of my remaining tires. I came down with what feels like a sinus infection. Surprisingly though, I’m surviving today better than I anticipated. My friends have returned from their vacations, the close friend that tended to me all week is still talking to me, I had additional friends help me out, my husband and children seem to still think I’m pretty special, a Chiropractor visit made my legs the same length again, and we had a few fun and memorable things happen over this past week. 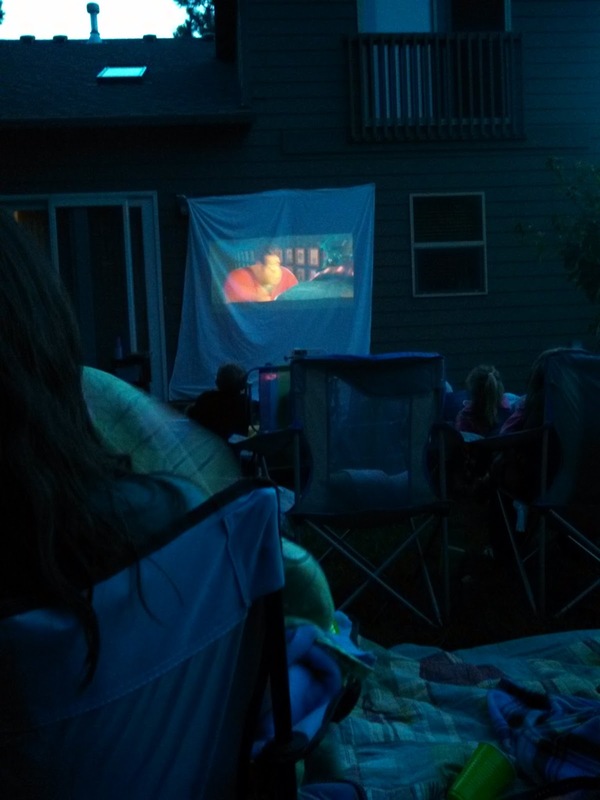 My son said his first official word: shoe; and we hosted a last minute outdoor movie in our backyard with the help of some friends. So, there’s a nice dose of real for you. Feel free to share some of the “real” you have going on in your life. I find that sometimes we just need to cry on the side of the road for a bit before we fix that flat tire and get back out there. My crying is done. Time to fix the flat. Team Jacob! Seriously, I think it is during these times that we end up learning those lessons we don’t really want to learn because the process is so painful. (Literally, for you.) So sorry you’ve had such a crappy week — but I just want you to know that despite all of the things that went wrong, you still managed to make the world a bit sweeter for those around you. Thanks for rescuing ME this week and helping me to survive my kids while my husband was out of town. You went above and beyond in your service to me — from dinner to the awesome backyard movie to just being there to listen to my never-ending voxes. Life is sucky sometimes — but I truly hope you’ll be blessed for all of the non-sucky things you did for those around you. You’re awesome, Sara.